When I headed to the mall to pick up the UA Fireshot, I did so for a couple of reasons. First, I’m a fan of Micro G and hey, that’s what these are built on so I figured I’d be guaranteed a good ride. 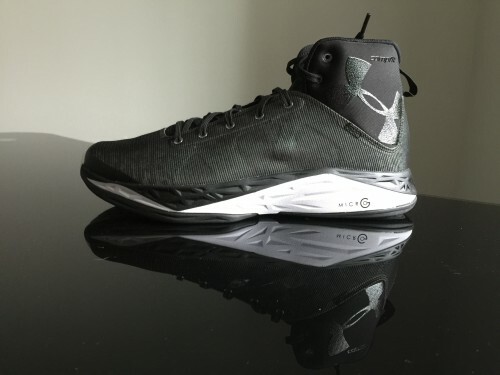 Second, the CompFit sleeve gave it a unique silhouette and bore a slight resemblance to one of my favorite UA silos – the original Micro G Juke, which was the first shoe to ever use CompFit. I have a pair I break out from time to time and I’ve always loved its sleek, clean lines. What I found after putting in the hours with the Fireshot on-court is a shoe that’s lacking in a lot of areas. The word that kept coming to mind throughout my wearings was unnatural. More on that to come. I will do my best to remind myself that this shoe ultimately wasn’t really built for a foot type like mine, so I’ll try to separate personal preference from overall performance at the end of this section. I went with a size 11, a half-size down from my true size of 11.5. Honestly, I think I could have gone to a 10.5 – there was that much room in the toebox for me. There was really too much volume all over for me in this shoe. My narrow foot was not built for this upper at all. The major portion of the upper is a Fuse-like synthetic mesh with overlays strategically fused along the interior of the upper (you can see the pattern they create in some of these pictures). In this aspect, the reinforcement was a great idea as it strengthened the upper without coating the whole thing in another layer of material. However, the synthetic mesh itself flexed extremely weird and unnaturally for me. The toebox creased funny because of how far down the tongue was stitched to the top of the toebox – it really needed to be a full inner sleeve. The odd flexing created hot spots (for me) at a couple of points along both medial sides of the shoes. Now I could see how many players could like the Fireshot – if you have a wider foot, it’ll probably fill up the interior nicely. For me, I had to lace tighter in order to get good lockdown and it created all kinds of bad flexing. There was a little bit of room all over, from heel to toe, and I didn’t really care for its ability to lock my foot in. It didn’t make me nervous or anything, but I the extra room was consistently noticeable. The CompFit sleeve is basically a neoprene bootie stitched to the vamp. It works with the tongue to form a plush collar when laced to the top, and it’s very comfortable. 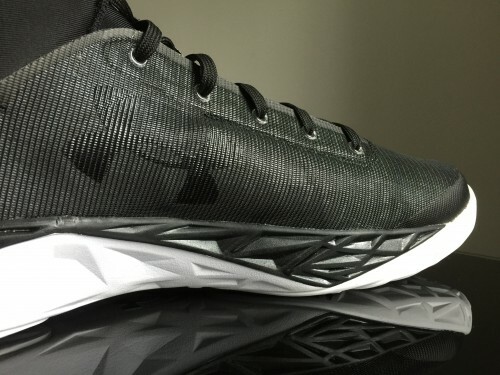 There’s some Achilles padding, though a nicer memory foam compound would have been better. The biggest thing I can stress with these is to try them on before you buy, if you at all possible. I could see this being a great upper for someone with a wider foot but it just didn’t work for me. Transition was definitely not the smoothest. It’s a full Micro G midsole (despite what the UA website says) but something about the shape of it makes it less than completely smooth. It’s not terrible, and bigger forwards may not mind it. I just happen to put a premium on natural movement in my shoes. For what it’s worth, I think the shape of the last itself is a little clunky – the outrigger feels too far forward and I don’t care for the sculpting of the midsole. Again, the UA site has it wrong. It’s a Micro G midsole underneath a rather unfortunate Ortholite insole. The Ortholite insole is cheap and soft, and makes it feel like you’re sinking into the midsole rather than giving you the familiar responsiveness of a Micro G insole + outsole. I swapped insoles a couple different times to see if it would fare better, and it certainly did. 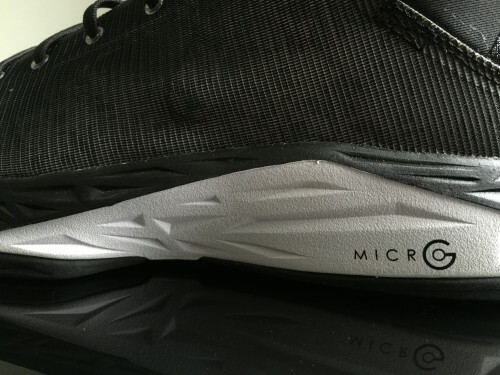 The Micro G insole from my barely-used Jukes fit well and improved the feel slightly. Support is average, but I found my arches getting more and more tired as games went on thanks to the lack of a midfoot shank. Court feel was a little muted thanks to the Ortholite, and thus responsiveness was less than enjoyable. There was nothing glaringly bad about it, but it didn’t feel like traditional Micro G. I’m a huge Micro G fan, but I didn’t like the application of it in the Fireshot. Stability was not a problem in any direction, as the wider base and outrigger took care of any lateral stability issues. I slipped on my old Jukes and the difference is remarkable. The Micro G in that setup is firmer and noticeably more bouncy than the Fireshot. This shoe is actually real comfortable to just slip on and wear around – the softness of the insole/midsole is great for that use – but on court it’s lacking in responsiveness and overall cushioning performance. I hate to say it, but the Fireshot felt cheap and unrefined on court. I wish I had some better things to say, but I really didn’t care for the traction setup either. 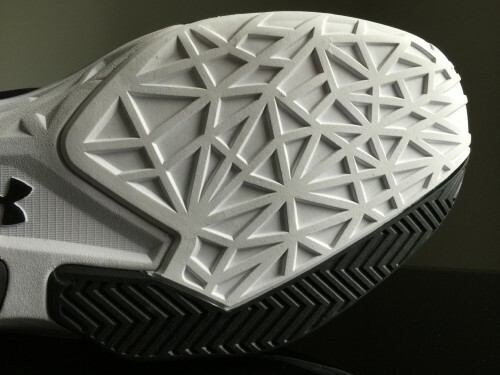 It’s an injection molded outsole with a geometric pattern for most of the surface of the shoe. 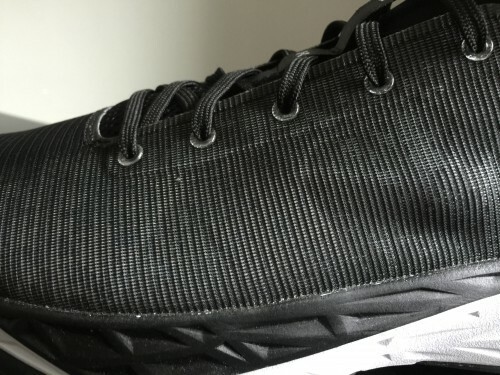 There’s a little bit of herringbone, but of course it was put on the lateral side of the shoe (instead of the medial) where it really does no good at all. The midfoot, ball of the foot and toe area are all this shattered glass-ish pattern and it really fails to grip the floor well unless you play on a very clean surface. The YMCA courts I play on are generally in average to good condition, but if there was any dust at all I wound up sliding all over. Not a good feeling. 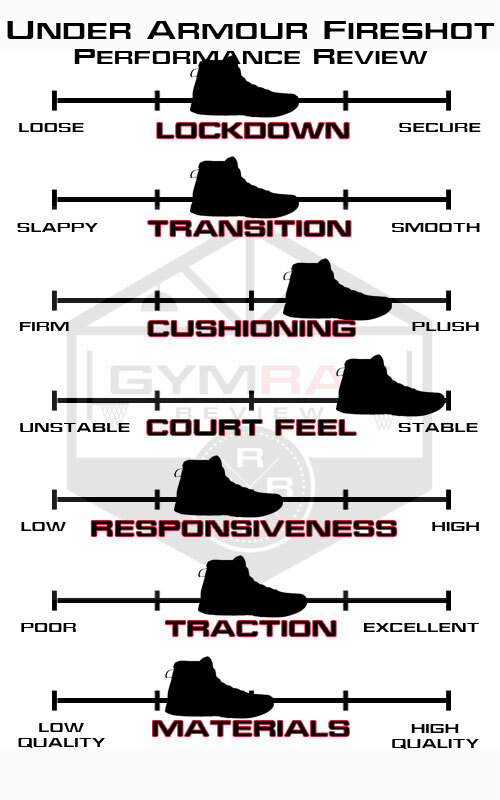 It’s not difficult to do traction the right way and UA has some incredible traction setups with the Curry 2 and Curry 1 already. The full herringbone of the first Curry sig would have been perfect. As you may have gathered, I didn’t care for the materials used. 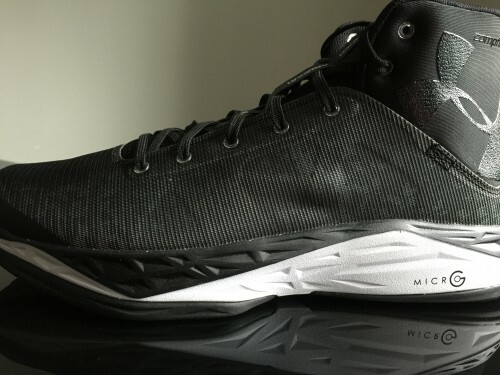 Micro G insole instead of the Ortholite slab, better Micro G midsole setup, and an upper that flexed more naturally would have changed things (I mean that’s basically the entire shoe). 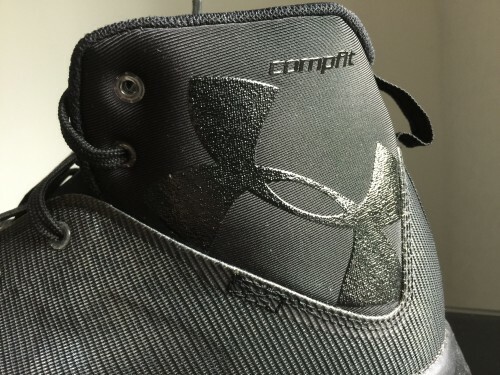 The CompFit sleeve is comfy, it’s just stuck in a shoe that doesn’t mirror its natural feel. It doesn’t integrate well into an upper that doesn’t allow for natural movement. I know I know haha I’m on a bad run the last few shoes. But I do try to be as fair and objective as I can – I try to point out what players a shoe might be good for even if I personally don’t love it. I’ve just played in a ton of shoes so I can be picky, and it would be a disservice to the people that read if I wasn’t brutally honest at times. It does a little. 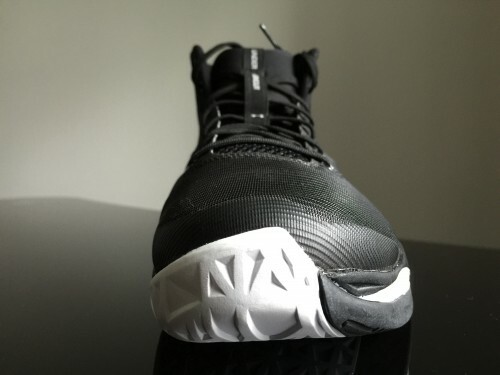 The issue with both of those shoes is the traction pattern creates too much of a flat surface and don’t allow the grooves to flex and bite. These just didn’t have great traction no matter how clean the court was. I’d agree on the BB. Good review. I was thinking of picking these up, but I’ll definitely pass having now read your review. Thanks. I also found these extremely disappointing. I saw the initial pics and was enthused by a full-length Micro G shoe in a sea of Charged midsoles, the use of CompFit and the ostensibly plush midsole. Seeing the shoe in person, however, my enthusiasm was curbed by feeling the upper and seeing the outsole. I found a pair for $50 on eBay and decided to try them out anyway. They are soft, I will give them that, but they don’t have the tensile, durable cushioning I am used to from shoes like the Torch 2, Juke 2, Anatomix Anomaly, etc. They were squishy and for the first time I felt a Micro G shoe “bottom out.” The traction was mediocre at best indoors and I didn’t even try it outdoors; it wouldn’t last long. I have a wide foot so I didn’t have the same issue with the fit as the reviewer, my normal size fit me well and didn’t crease in odd places. That said, I do think the shoe is a little awkward in terms of construction and just average in terms of support, both medial and ankle. 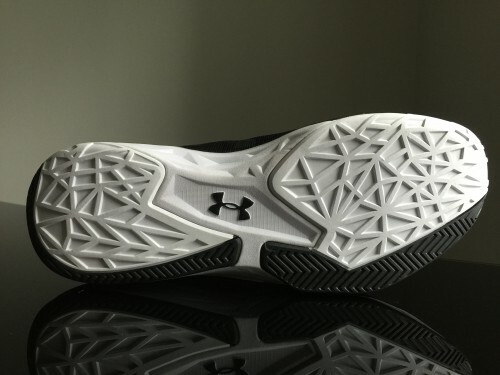 I definitely expected more from this shoe and think for the first time I have found a UA hoops shoe that is a bad value. $120 is too much for these, though I’d had gladly paid that for the less expensive models I mentioned above.